We visited a chocolate factory tonight, and it was wonderful. 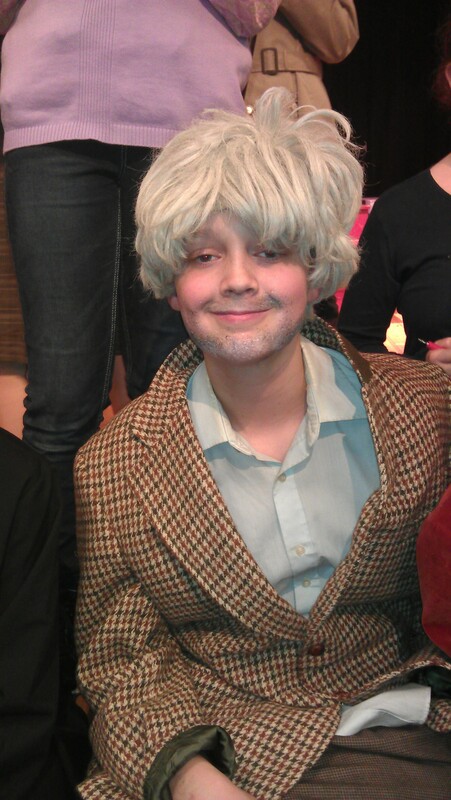 Zachary as Grandpa Joe. Dig the wig! It was the opening night of Whitford middle school’s production of Charlie and the Chocolate Factory and my son and daughter were on stage. Big roles for both. A papa and a mama couldn’t be prouder. Twice during the evening, each said they messed up big time. Of course the audience didn’t know this, but they did. My wife Melissa and I did our best to encourage them and they both truly delivered excellent performances, but being tired and making a mistake was a bit much. Fortunately, they’re resilient and finished strong. … a Willy Wonka attitude? The attitude of – let’s try again, oh well. The attitude of – whoops, next time for sure. Or should I say … failures? Mr. Wonka didn’t have time for failures because he knew they weren’t worth his time and he knew they were part of making great candy. He just dealt with them and went on. It takes practice, courage, and a stiff upper lip to turn your back on a failure. Yet, that’s what is needed to succeed. Oh, and of course we have to be honest with ourselves and accept when we didn’t do well. Mr. Wonka would demand honesty. It’s the big test. Next time you flub your lines, try a taste of Willy Wonka attitude. Happily went to my son and daughter’s opening night performance, helped clean up chairs afterwards, and gave a little input on a sparked challenge. This entry was posted in In the community and tagged Charlie And The Chocolate Factory, Children, chocolate, postaday2011, Willy Wonka. Bookmark the permalink.